New Zealand-bred galloper Werther needs to overcome a high tech Japanese challenger to defend his HK$20,000,000 Audemars Piguet Queen Elizabeth II Cup crown on Sunday. Japan’s Neorealism brings an element of the nation’s renowned technological expertise to the international Group I race. Plus he has the ‘magic man’ on top with champion jockey Joao Moreira booked to ride. Neorealism has reportedly looked well in cantering work in recent mornings and attracted more than the usual attention as track rider Shinjiro Kaneko’s goggles were adorned with what appeared to be a camera-like device. It was more than just a camera but also a monitor, manufactured as an aid to training which displays heart rate and speed. The monitor, which the rider can see, displays the horse’s heart rate in real time and the track work times for each 200 metres split. It is valuable new technology which allows the rider to know exactly how fast he’s travelling and to have an indicator of how much the horse is exerting itself and the trainer is able to download and evaluate the data. The heart rate data is recorded via pads inserted in the girth strap while the camera attachment is fitted with a GPS and the data is displayed in a small monitor attached to the rider’s eyewear. The evolving training tool is an extension of measuring lactates and heart rates via horses working on treadmills which has been commonplace for some time. This is just more sophisticated and allows the trainer to tailor work specifically to individual horses based on the heart rate data. Victories in the Audemars Piguet QEII Cup and Hong Kong Derby saw the son of Tavistock named Horse Of The Year in Hong Kong for the 2015/16 season. 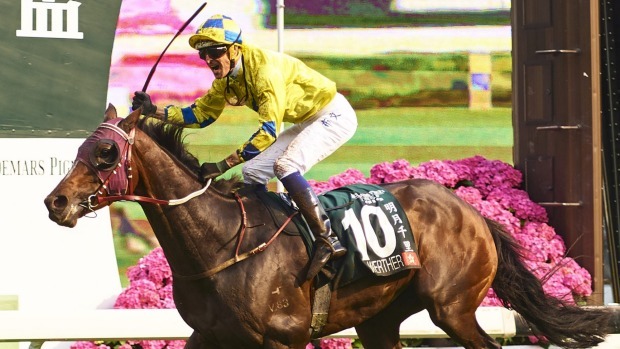 Hugh Bowman the Australian rider of champion mare Winx, looks forward to claiming back-to-back wins aboard Werther for owner Johnson Chen who purchased the horse as a 3-year-old from a Kiwi ownership syndicate which included Campbell. Bowman says the key to Werther’s winning chance may be his ability to get the horse to settle as well as when successful in 2016. “The biggest thing is getting him to relax in his races. I’d say that last year’s QEII is the only race I’ve ridden him in where he’s really settled and relaxed in the run and we saw how that allowed him to finish off his race,” Bowman said in reference to his four and a half lengths winning margin in last year’s contest. “Obviously I’m looking forward to Sunday’s race. I don’t think the race is as strong, on paper at least, as last year but in saying that he [Werther] hasn’t quite had the same grounding, hasn’t had the same amount of racing leading into this. “I think the harder the race and the more intense the contest, the better he goes. And there might not be much pressure early in this race, which isn’t ideal,” Bowman said. Nevertheless, Bowman remains confident about the John Moore-trained Werther, who is unbeaten in three runs at the course and distance. “If he relaxes he’ll finish over the top of them,” he said. Next Post:Boxing’s ring girls: harmless entertainment or Dark Ages sexism?